You’d be forgiven for thinking that contemporary technological development in Japan was centred solely on making things smaller and enhancing virtual experiences. While that emphasis undoubtedly presides over trends set in Akihabara, Tokyo’s gaming district, Japan also continues to pave the way for developments in locomotion and machinery, thanks to one individual in particular. 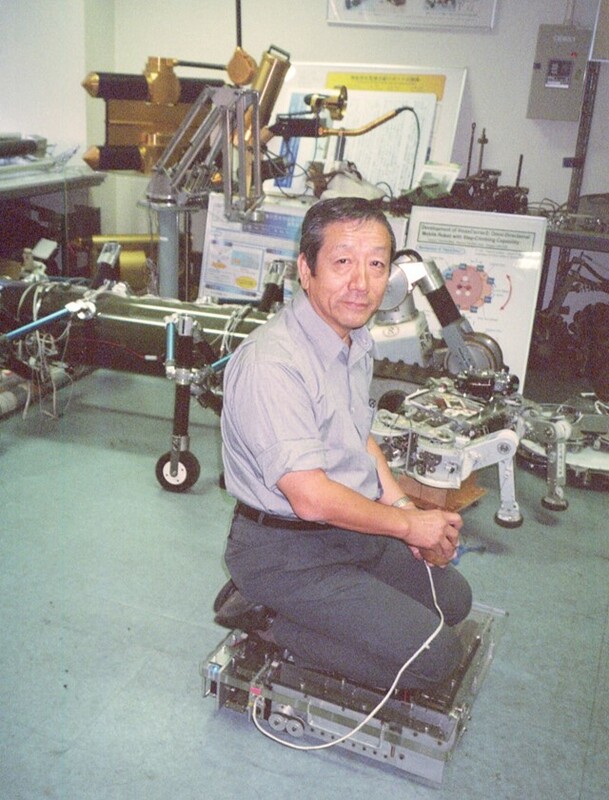 Professor Shigeo Hirose is arguably the most important robotics engineer in the world. His portfolio catalogues a series of innovative and historically pivotal inventions impacting the fields of robotics, arms, automation and disaster control. His 30-odd academic prizes include the first Pioneer in Robotics and Automation Award from the IEEE Robotics and Automation Society, and he has worked with the United Nations to develop a remote-controlled robot capable of clearing landmines. During a break from teaching duties at the Tokyo Institute of Technology, he fills us in on the present state of robotic engineering, the future of artificial intelligence and his career-long frustration with the inconsistencies of science fiction. How did your career in robotics begin? Shigeo Hirose: I always wanted to do something in my life that allowed me to dream. Robotics asks you to imagine a world that doesn’t exist yet, with technologies that work in a different way to how they work now. I studied mechanical engineering and graduated from Yokohama National University in 1971, 41 years ago. A year later I had invented a snake-like robotic arm, and I’ve been adapting it ever since with my team of students – we’ve made 30 or 40 new models. What made you first decide to make a snake-like robot? Shigeo Hirose: Well, a snake is very interesting. It is simple but capable of doing a lot of things – it can move, it can wrap itself around things, it can lift itself up. I am still developing practical applications for the snake robot but it is already being used in different ways. We invented the gastroscope, for instance, which can travel into a patient’s gut and allow doctors to view their insides. It isn’t perfect and we are waiting for some breakthroughs but it has been used. And in the Fukushima Daiichi nuclear disaster last year, one of the arms was able to go in and treat areas that were too toxic for humans to access. What else have you developed outside of the snake model? Shigeo Hirose: I invented the Soft Gripper – it’s like an arm that can close around an object. The holonomic omni-directional vehicle VmaxCarrier, which you can control remotely. Also, a planetary exploration rover, the Soryu V, which can climb vertically and navigate uneven terrain. While doing this however, I have always been developing the snake-like robot, throughout the whole of my career. Shigeo Hirose: Maybe not so different from the present day, except every machine will have become very easy to use and will have adapted to follow the order of the people. The accumulation of tiny inventions creates very useful machines. For example, in the case of the automobile, the basic idea is four wheels and one engine. But look at how much cars have changed over time! They are entirely different to what they used to be. These developments will be happening in every field. So we shouldn’t be preparing for a future that resembles a science-fiction film? Shigeo Hirose: I think science-fiction writers have lots of misunderstandings about technology. In a lecture I showed a scene from Total Recall and discussed the contradictions in the story. For example, there is a car being driven by a humanoid, which is very strange because if we’ve reached a point of making such advanced humanoids, then the engineer would have certainly installed the same intelligence in the car. We wouldn’t need a humanoid! It’s as if the science-fiction writer thinks the current taxi will be preserved and the humanoid developed. But if the humanoid is invented in future, then all the other machines will have evolved at the same rate. This is why I don’t particularly enjoy science fiction. Is there any science fiction that you like? Shigeo Hirose: No. I’m always trying to find contradictions in the story. When can we expect to see humanoids? Shigeo Hirose: At the moment it is still a future target. We can imitate the human, as proven by the (humanoid robot) Honda Asimo, but developing something like, say, a tactile sensor that can sense things as though it were skin is still very difficult. The materials that make up a human being are very different to what we have in technology, as is the energy source. If the raw materials are entirely different then it stands to reason that the product will be too. So robots and humans won’t be indistinguishable for a long time then? Shigeo Hirose: If we can develop a way of accurately replicating the muscle mechanism of a human then we’d be able to make a very good machine, a very good robot. But the technology is very difficult. I’ve been watching it for 40 years and believe that the humanoid might happen in about 40 or 50 years’ time. But in that time all other machines will have evolved to become more intelligent too. What do you make of humans developing robotic elements to add to their own anatomy, aka ‘cybernetics’? Shigeo Hirose: I know people do such things and it works but I feel that it is mostly just for advertisement. It is not so useful. What is your view of the use of robotics in warfare? Shigeo Hirose: Unfortunately, robot technology is very strongly related to weaponry. The Tomahawk (missile) is a kind of robot – it checks the shape of the ground and flies and hits targets. And of course, aeroplanes and tanks are becoming very intelligent these days. But at the same time, the iRobot PackBot, a military robot that was used in the battlefields in Afghanistan and Iraq, was also used at the Fukushima nuclear plant after the 2011 Tohoku earthquake and tsunami. Have any of your inventions been used in a way that you weren’t comfortable with? Shigeo Hirose: Some of the technology might have been used in a bad way and then in other cases in a good way. Take a knife, for example. It was designed as a weapon but it’s one of the most important implements used in surgery and improves people’s lives. But technology is technology. It is not related to war or peace. We have to develop and sometimes it will be used for war and sometimes for peace. But that’s politics. Why have Japan always been the forerunners in the field of robotic technology? Shigeo Hirose: Well, we don’t have many natural resources and we realised that this was a way of guaranteeing survival.